Show that the sum of the vectors discussed in Example 3.2 gives the result shown in Figure 3.24. Example 3.2: A woman sailing a boat at night is following directions to a dock. The instructions read to first sail 27.5 m in a direction $66.0^\circ$ north of east from her current location, and then travel 30.0 m in a direction $112^\circ$ north of east (or $22.0^\circ$ west of north). Find the location of the dock. Figure 3.24: Vector illustration of the displacement of the sail boat. This is College Physics Answers with Shaun Dychko. In example three dot two, a graphical method was used to find the resultant. The resultant is here and in this problem our job is to use analytical methods to confirm that the answer that was found using graphical methods, is correct. So we're going to find the components of the resultant vector by adding the corresponding components of the vectors that are being added together. So we have vector A of length 27.5 meters at an angle of 66 degrees north of east. Then we have vector B afterwards is at an angle of 68 degrees north of west. I prefer to use this angle in here 'cause I like to work with acute angles. You could also work with 112 degrees too but I'm just more used to using angles that are less than 90. Okay. So we have the x component of the resultant -- I put a prime here just because that's what's in the figure, don't really need the prime, but it's there so let's use it -- that equals the x component of the A vector plus the x component of the B vector. So for the A vector we have these two legs on the triangle, this vertical leg and this horizontal leg. The horizontal leg is the x component and it's the adjacent leg of this right triangle. So we'll find it by multiplying the length of the hypotenuse by cosine of this angle, 66 degrees. Then from that we'll subtract 30 meters times cos 68 and the reason we're subtracting is because for this vector B, its x component is going in the negative direction. It's going this way. Then its vertical component is going upwards but we'll use that in the second line here. So we have a minus there because the x component of the B vector is going to the left. It's 30 times cos 68 and we're using the cosine trigonometric function because this is the adjacent leg of this right triangle and we're multiplying it by the hypotenuse. Okay. That works out to negative 0.05294 meters for the x component of the resultant. For its y component, we have the sum of the y components of the A and B vector. So for the A vector the y component is 27 and a half meters times sine of 60 because this is the opposite leg of that triangle. That's why we're using sine. Then for the B vector, the y component is 30 meters times sine 68 and that give 52.938 meters. Then the length of the resultant then is going to be the square root of the sum of the squares of its components and so we're squaring this number, and then adding it to the square of this number, and taking the square root of that sum. This gives us 52.9 meters. Then for the angle, we take the inverse tangent of the y component of the resultant, divided by the x component of the resultant, and I put vertical bars here to mean absolute value 'cause we're just concerned with the magnitude of the numbers. We don't need to put any negatives in here because we'll figure out the direction by looking at the picture. So our picture is that the resultant is -- has a tiny bit of component to the left and a large component upwards. Maybe I'll draw it like this. Well, this is fine. Yeah. So we have the y component of the resultant and the resultant will be like this. So this y component if we think of it as being here, and the x component as being down here we can draw it either side, then if we take the inverse tangent of the opposite over the adjacent, what we're finding is this angle that's in here. So whatever answer we get for our inverse tangent, it's going to be this angle and that'll be such and such degrees north of west. So this angle is to the north compared to west. So that's the inverse tangent of 52.938 meters over 0.05294 meters, giving us 89.9. 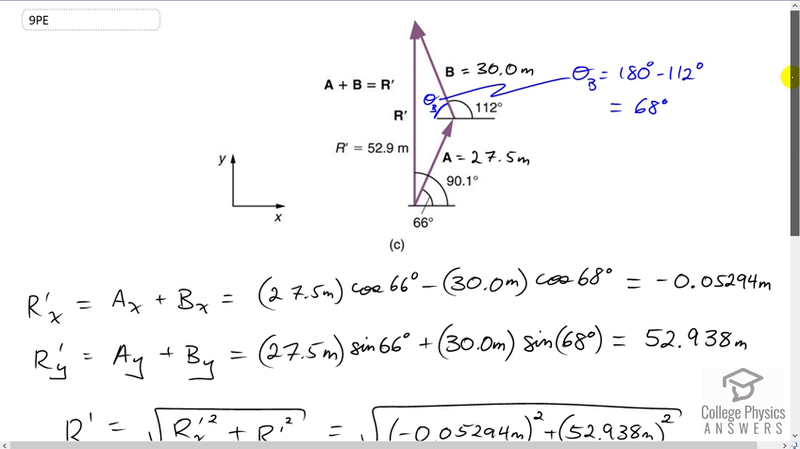 So our final answer for the resultant vector is 52.9 meters at an angle of 89.9 degrees north of west and with analytical methods, we have confirmed that this drawing is correct. Now, they've drawn, they've written a 90.1 degrees here, and the reason they have 90.1 is 'cause they've chosen to use, to write their angle with respect to the positive x axis. We have instead made our angle with respect to the negative x axis and it's 89.9 degrees from the other direction and it's an equally correct answer. You'll find that 89.9 plus 90.1 makes 180 which is a way to confirm that these numbers are correct because a straight line angle have to add up to 180.